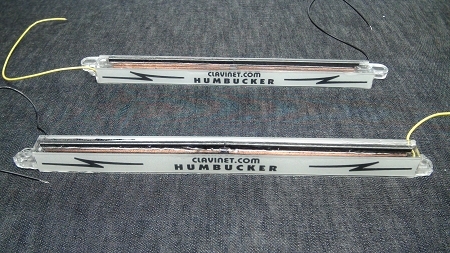 Since the year 2000, the legendary Clavinet.Com Humbucker has been the best-selling clavinet pickup in the world. The biggest source of NOISE and HUM in a clavinet come from its massive single coil pickups. Fender Guitars share the same problem and a solution was invented many years ago in the form of Hum-BUCKING pickups. "Humbuckers", as they are called, feature two single coils in one pickup. The two coils cancel each other's hum out, making the humbucker pickup quieter than a single coil pickup. Trusted by recording studios everywhere to deliver the lowest noise floor possible, Clavinet.Com Humbuckers are voiced exactly the same as the original pickups, yet feature an improved, extended frequency response, giving your clavinet the fattest sound possible. Try them - you won't be disappointed! 30 Day Money Back Guarantee. One year warranty.